Buying a Cot Bed Mattress can be tricky. There’s so much information to consider and you want your baby to be safe while they sleep so it’s hard to know what to do. So I put together this guide to cut out some of the noise and tell you everything there is to know about choosing the Best Cot Bed Mattress. I’ve got my favourites in the table below, just click the name and you’ll be taken to where you can order yours! At first glance it can seem like two different names for the same thing but in fact, they’re not. (I’m sure some of you will already know this but for those that don’t I thought I’d include it). A Cot is smaller and suitable from birth till about 1-2 years old, whereas a cot bed is bigger and can be used from birth to about 5 years old. It depends on how big they are of course but as a general rule that’s how it works out. Cot beds also have removable sides and so turn into little beds for toddlers once they’re big enough to be trusted not to escape. Although a little more expensive. but for how long you can use them they’re definitely better value. Of course if you don’t have the space it’s a different issue because The Foundation for the Study of Infant Deaths (FSID) recommends that your baby sleeps in your bedroom for the first six months. So if a cot bed won’t fit go for cot instead. 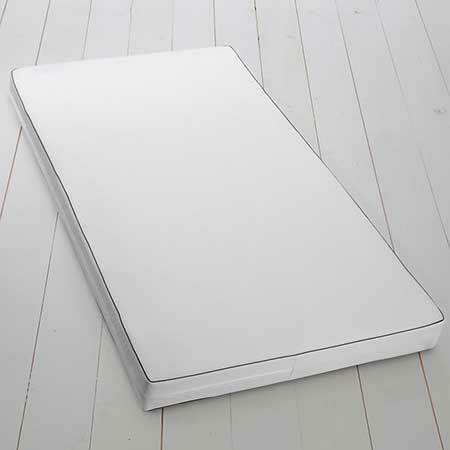 I’m mainly focusing on the best cot bed mattress which is usually 140 x 70 cm but some of the mattresses also come in cot size of about 120 x 60 cm so if you’re looking for a cot mattress you’re still in the right place. The Lullaby trust have a fantastic guide to baby sleep safety so I recommend checking them out for more information. But the jist of what they say is make sure the baby mattress is firm, flat, free from damage, and waterproof. So that’s all the things I’ve looked for in my cot bed mattress recommendations. Some of them aren’t waterproof but John Lewis sell a great waterproof cot bed protector so you can pick that up quite cheap as well. But I’ll talk about that further down. The Two main types of filling in a cot bed mattress are spring and foam. Spring is always a good choice because it’s nice and firm and doesn’t require any chemicals to make. Robust, durable and long lasting. Foam has a lot of different types but memory foam is most common. It’s a little softer and more suited to toddlers than newborns who need the firmness of spring. As long as it meets safety standards memory foam is perfectly safe for babies. The final bonus filling is Latex, latex is made from trees and is a great natural alternative to memory foam which is made chemically. Again great for toddlers but not ideal for newborns. Is It Hypoallergenic?Not essential since not every child has allergies but a hypoallergenic cot bed mattress keeps out dust and dust mites keeping the whole thing cleaner. Is It Waterproof? as suggested by the Lullaby Trust making sure it’s waterproof is always good, but if it’s not, consider the mattress protector below. This mattress protector isn’t like other waterproof ones because it doesn’t have that horribly crinkly feel like a hospital bed. Instead it absorbs and spreads out moisture which quickly dries and you can just put it in the washing machine. It also doesn’t have any dangerous straps to attach it to the mattress just a specially designed back that stops it slipping around. Overall, the best Cot Bed Mattress Protector around. You’ve made it to the main event! Here I’ve reviewed the best cot bed mattresses including a range of different ones so you can find exactly the mattress your baby needs. And I’ve linked through to where you can buy each one so you can order yours today! 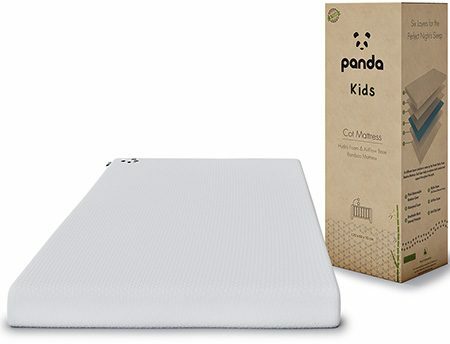 There are loads of great things about the Panda cot bed mattresses, for one thing, they are very eco-friendly being made from bamboo and when your child has outgrown you can send it back to Panda and they’ll clean it up and donate it to charity if it’s still in good condition. The memory foam inside is actually Panda’s own Hydro FOam which is specially designed to regulate temperature this means your little one will sleep sounder through the night because overheating is a classic cause of disturb sleep and waking up through the night. The bamboo cover is lovely and soft and completely hypoallergenic plus it’s removable and washable, and underneath that is a nice waterproof layer which keeps the mattress safe day in and day out. This is a great compromise because waterproof layers are never as soft so your baby (or toddler) get a nice soft layer to sleep on and the mattress is still fully protected. 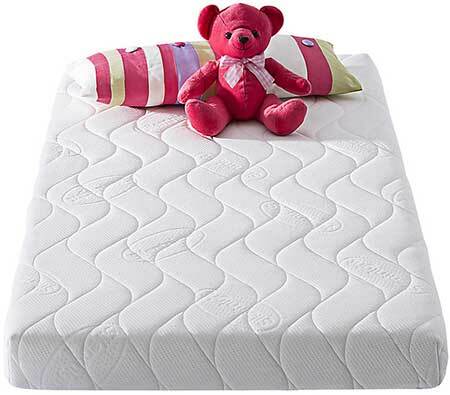 Overall a great baby mattress, eco-friendly, reasonably priced, waterproof, and comfortable. A great choice for your little one. Now, I’m sure you’re wondering what on earth a coconut filling is right? That’s not spring or foam! Well It could just be even better. Coconut fibers get squashed together to act as a really firm supportive mattress base ideal for babies up to 12 months. Then you flip the mattress around and you’ve got a latex side ideal for toddlers. A little softer and still completely natural. This is all wrapped up in wool which is a natural fire retardant so no need for chemicals and it’s naturally hypoallergenic. That all goes inside a nice soft cotton case. Only problem is it’s not waterproof so you’ll need a mattress protector like the one above. Overall, The best cot bed mattress on the list. Long lasting, all natural and will see your child safely through their time in the cot bed. If safety is your concern then look no further. The Silentnight Safenights cot bed mattress as a special quilted cover that allows a free flow of air so if by some unfortunate circumstance your baby ends up on their belly they can still breathe. If you’re putting them to bed properly they, of course, shouldn’t end up on their bellies but it’s great peace of mind if you’re a worrier. 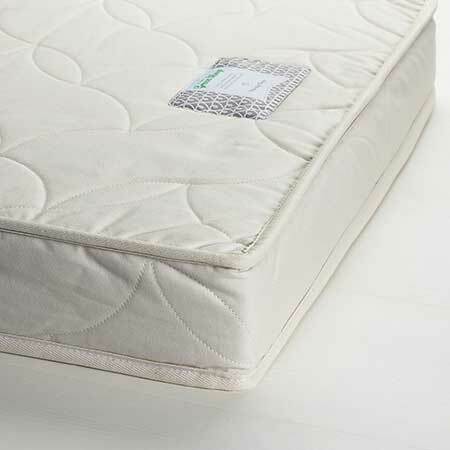 The mattress is foam free and treated with Purotex which protects it from allergens and dust mites and it’s recyclable. It’s also double sided with a thicker cover on one side for winter and thinner on the other for summer. Overall, a great cot bed mattress if you’re looking for safety from a very reputable brand. The Eve Mattress is adored amongst adults and it’s no different for their baby mattress either. 15% of every sale goes towards the Lullaby Trust which is great and the whole thing has a waterproof washable cover. But it’s still nice and soft and breathable so your baby won’t overheat. 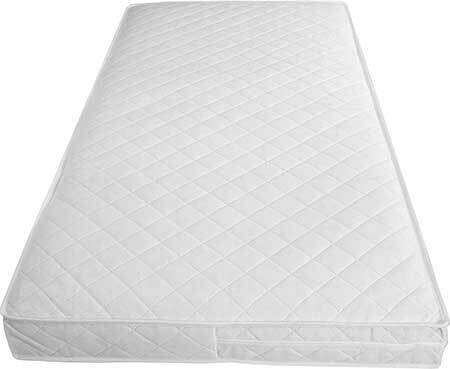 It’s made of comfortable pocket springs which are surrounded by a layer of memory foam for extra support. A 5-year guarantee is wonderful because it’ll last the entire span of the cot bed years. They say it’s suitable from birth to 6 years but that very much depends on the size of your child. Overall, I really like that they support the Lullaby trust with each sale and the guarantee gives some extra peace of mind. The John Lewis Cot bed Mattress is an ideal budget friendly mattress. It was designed with hygiene in mind and features two covers, the outside one is waterproof and if it needs to go in the was in the middle of the night the undercover is less so but still very water resistant if it happens twice in a night. It’s all very breathable and generally very comfortable so your baby will be sleeping soundly for years. It’s also available in a Cot Size just click here. Overall, a solid choice if you need a cot bed mattress that’s simple straightforward and good quality. Now this is a very budget cot bed mattress and that always makes me a little suspect. But it seems that it is bought straight from a factory that produces other brands baby mattresses so it should be fine. It is made with a basic spring unit compared to the pocket spring found in others which means it’s not as comfortable but this does keep it nice and firm. The outer cover is washable and then the inside cover is waterproof so it’ll need wiped down if the outer cover is removed for a wash in the middle of the night. Overall it’s definitely not the best mattress out there but if money is tight it’ll do you proud. Can I Use A Second-Hand Cot Bed Mattress? It’s not normally advised but if it’s from a family member and you can see and feel that it’s still good quality then it should be fine. Just make sure there are no tears and have a feel to see if there’s any sags or soft sections. If there are it’s no good and you’ll have to recycle or throw it out. 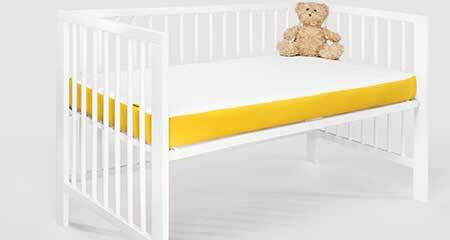 Will A Cot Bed Mattress Fit Into A Cot? Unfortunately not, a cot bed is bigger than a cot so you’ll need a different mattress for each if you decide to use both.